Now that you’ve created your model entities and implemented your business logic to create and modify those entities, you probably have some ideas for helping users input valid model entity data. For example, in the Event Listing project you’ve been working on throughout this chapter, you want users to create social events for the future, not for the past. And it would be nice to give users a nice text editor to fill in their descriptions. Wouldn’t it be great to specify these customizations from a single place in your portal project? Good news! Service Builder lets you specify this information as model hints in a single file called portlet-model-hints.xml in your project’s docroot/WEB-INF/src/META-INF folder. Liferay calls them model hints because they suggest how entities should be presented to users and can also specify the size of database columns used to store the entities. The root-level element is model-hints. In this are all your model entities represented by model elements. Each model element must have a name attribute specifying the fully-qualified model class name. Each model has field elements representing its model entity’s columns. Lastly, each field element must have a name and a type. Each field element’s names and types correspond to the names and types specified for each entity’s columns in your project’s service.xml file. Service Builder generates all these elements for you, based on service.xml file. In order to see the effect of a hint on a field, you must run Service Builder again and redeploy your portlet project. Changing the display-width doesn’t actually limit the number of characters that can be entered into the name field; it’s just a way to control the width of the field in the AlloyUI input form. Remember to run Service Builder and redeploy your portlet project after updating the portlet-model-hints.xml file. So, we’ve mentioned a few different hints. It’s about time we listed the portlet hints available to you. The following table describes the portlet model hints. Liferay Portal has its own model hints XML configuration file called portal-model-hints.xml which is in Liferay’s portal-impl/classes/META-INF folder. Liferay’s model hints configuration file contains many hint examples, so you can reference it when customizing your portlet-model-hints.xml file. As always, remember to run Service Builder and redeploy your project after updating your portlet-model-hints.xml file. Now you can use a couple of model hints in the Event Listing portlet and Location Listing Portlet. Start by giving users an editor for filling in their description fields. Since you want to apply the same hint to both the event and location entities, define it as a hint collection. Then you can reference the hint collection in them. Great! Now rebuild your service using Service Builder, redeploy your portlet project, and add or edit an event using the portlet. The following figure shows the portlet displaying the input fields as we specified. 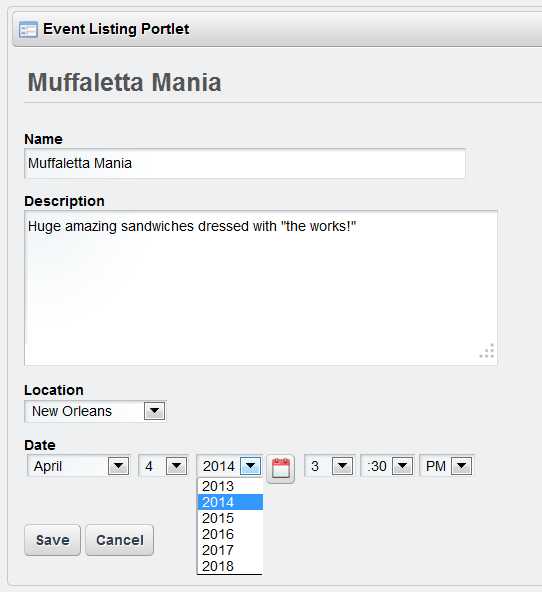 Figure 4.9: Customizing string input fields to use spacious text areas and customizing date fields to filter-out past years are just a couple examples of the many things you can do with Liferay model hints. Well, you’ve learned the art of persuasion through Liferay’s model hints. Now, not only can you influence how your model’s input fields are displayed but also can set its database table column sizes. You can organize hints. Insert individual hints directly into your fields, apply a set of default hints to all of a model’s fields, or define collections of hints to apply at either of those scopes. Looks like you’ve picked up on the “hints” on how Liferay model hints help portlet data! Next, let’s find out how to implement a remote service.